Line a 9 inch square baking pan with parchment paper with long edges. 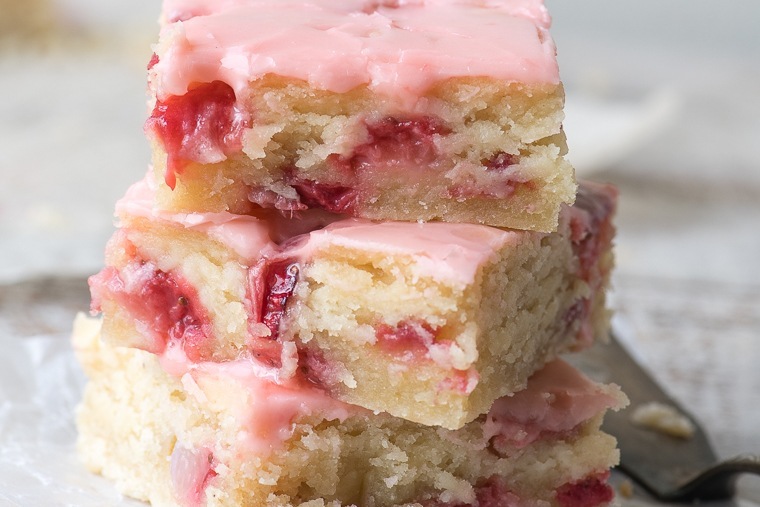 This will help you lift out the blondies for easy glazing and slicing later. Cream the butter and sugar until fluffy. Beat in the egg. When the egg is full incorporated, beat in the lemon juice. The lemon juice will probably not completely incorporate at this point, that's ok.
Whisk together the flour, baking powder, and salt, and add to the wet ingredients, mixing until no more dry flour is present. Gently fold in the diced strawberries. Spread the mixture into your pan and spread out as evenly as possible. Bake for 30-35 minutes, just until starting to turn golden around the edges and the center is set. A toothpick inserted in the center will be moist but not wet. Don't over-bake these, or they will dry out. Let cool on a rack. Trim the strawberries for the glaze and puree in a small food processor. Strain the puree through a small strainer to get 1 Tbsp of puree. Whisk together the sugar, puree, and lemon juice until no lumps remain. If your glaze is too thin, add a touch more sugar. If it's too thick, add more lemon juice. Spread the glaze over the cooled blondies. Let the glaze set before slicing.